Seemingly forever, Dolce and Gabbana have been at the helm of the fashion world. It is common now for the big brands to have a plethora of designs featured on their websites to cover many different styles. Whilst smaller brands can only produce one uniform collection per season, the larger brands, like D&G, can produce several. This is illustrated above in the differences between these eight featured bags. 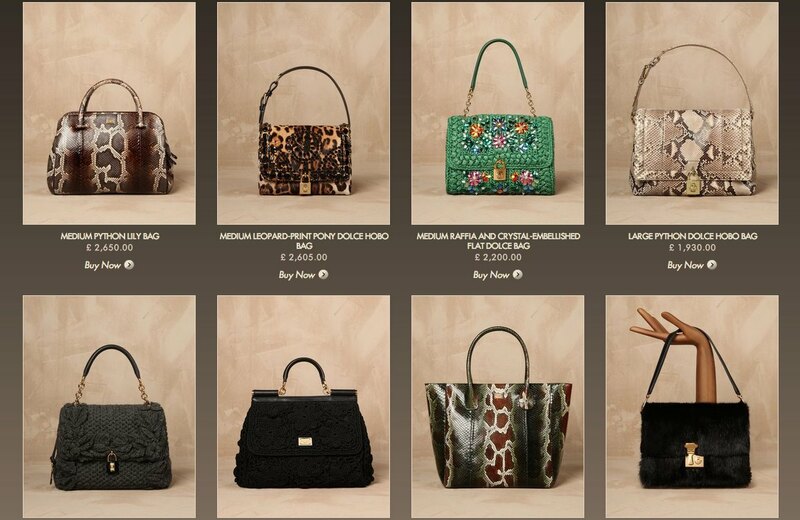 Interestingly, if you look through all of these different designs, you will find that the more conservative bags are those that are less pricy, meanwhile the more dramatic ‘medium raffia and crystal embellished flat dolce bag’ and the ‘large python dolce hobo bag’ are more expensive. Of all the bags currently on sale at the D&G online store, the medium python lily bag is the grandest, pricing in at 2,650 pounds. But there is certainly a bag for everyone, with some of the smaller clutch bags costing only a couple hundred pounds. Funnily enough, none of the bags featured take my fancy, with the houndsooth bag featured on the website being one of my favourites. Previous: Trend Report | De Beers 2013. Diamond Royalty..
Next: Trend Report | Genny Shoes. Maintain Your Pose..